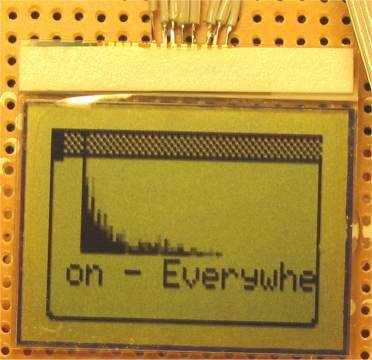 I have a Nokia 3310 display interfaced to LPT port and experimental LCDInfo driver for it running. Last edited by Henri on Wed Sep 22, 2004 11:40, edited 8 times in total. nice look - what is the next you are going to connect to LPT ? i have a i friend who want to connect is old 386 laptop to his new comp lpt port, that would do a big lcd. Can you please mail me some detail of how to connect the lcd? I have a old 3310 and a old 6110. It would be very nice if i can use them!!! What is the resolution of this screen??? 2) Henri, please correct me if I am wrong but it looks like the controller uses serial data transmition??? The 3310 lcds are actualy called LPH7779, LPH7677 or LPH7366. I think 3310 uses the 8 pin display and 5110/6110 might have the 9 pin version. And yes the display uses serial protocol and I'm bitbanging the bits through a parallel port pin. I have the display connected to the parallel port data pins and I'm also powering the display from the parallel port. I'm using a LP2950 regulator to get the +3.3v voltage from the parallel port's +5v. For the 5v to 3.3v logic level conversion I'm using a 74LCX245 chip that seems to fit this purpose well. The reason I chose these components is that I already had them so I didn't need to go looking for anything else. There are also many other ways to handle the level conversions. I believe that the PCD8544 chip could also work fine at 5v logic levels but I haven't tested that and it's out of the normal working specs of the chip. So you're on your own if you test that. As you can see I'm taking power from pin 7 for all the parts I mentioned in this post. It has been working fine for me but I take no responsibility if you kill your parallel port or something else doing to same connections. I have connected the VOUT pin of the display through 2.2uF capacitor to ground. PCD8544 datasheet says 1uF is minimum. Also I have a 1uF capacitor at the output of LP2950. There has been some confusion lately and I've been getting lots of mails asking for help connecting different nokia displays to lpt port. Most of the questions I've been getting by email have been already answered in this thread so if you have some questions you should read this through first. Also it's recommended to ask the questions here in the forum if there isn't some reason for private emails. Last edited by Henri on Sat May 15, 2004 14:10, edited 2 times in total. could you give us the driver to control this screen? The driver to use the display is included with LCDInfo now so there's no need to ask it from me anymore. Until I get to include the driver to the LCDInfo package you can email me and I'll send you the latest driver. Last edited by Henri on Tue Jun 22, 2004 12:26, edited 2 times in total. I'm taking the power for the whole thing from LPT port pin 7 but it's also possible to feed the circuit from other power source. Just remember to leave LPT pin 7 not connected. I think that as long as the input voltage to LP2950 is >3.5v the circuit should work fine. How I can connect my old Nokia 3210 LCD on paraller/serial-port?